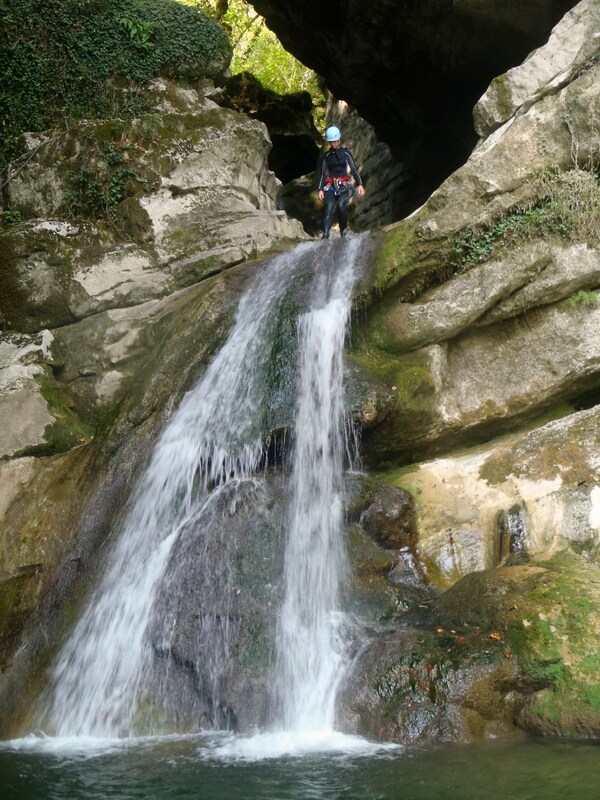 Canyoning is a water sport descending the bed of a stream. The descent is made possible by abseiling, jumping and sliding naturally down the waterbed. Close to Annecy, Aix-les-bains and Chambéry, Esprit d’Aventure discovered the most beautiful canyons of Savoie and Haute-Savoie. An ideal canyon for all the family and perfect for the children. Everything is concentrated, slides, jumps and abseilings wait for you. A real natural amusement park in a magic frame to just 20 min of Chambéry, 30 min of Aix-les-Bains and 45 min of Annecy. Perfect for a first canyon in Savoy, playful and fun. It is located on Lake Aiguebelette, at 30 min of Aix-les-bains and at 20 min of Chambéry, Jumping and abseiling are non-mandatory! In the heart of the Bauges, to just men 30 min of Aix-les-bains and Annecy, this canyon is the reference country in Savoy. This is a series of jumps (non-mandatory) and abseiling up to 10 meters down. Swimming is essential in this canyon as it contains many deep passes. One of the most beautiful canyon in France, this sequence includes jumps up to 14 meters high, abseils and siphons (swim under the rock) in an extraordinary landscape. This canyon has a very narrow first part that leads to a more open second part that will not leave you disappointed! Really beautiful scenery! Just a step from Annecy, this canyon is known for its majestic 60-meter waterfall that you will enjoy abseiling down into the pristine waters of Lake Annecy. The intermediate package starts with a 35 meter abseil down the waterfall. The expert package offers you the opportunity to explore the waterfall in its entirety (60 meters down) and continues with jumps, slides and many other breathtaking activities! it is essential to have sneakers, swimsuit and a towel. show Canyon esprit d’aventure on a big map.